After many years of having Windows-based smartphones, I decided to change to an iPhone because (a) I didn’t like the look of the new Windows phones, and (b) I saw various board games being released on iPhone. Zooloretto was the first major conversion and was the first one I bought when I got my iPhone. Zooloretto is a light board game that won the coveted Spiel des Jahres award. 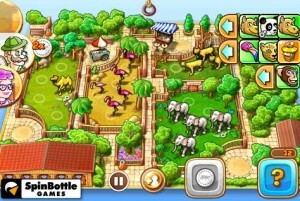 Players are all zoo keepers with their own zoos and they try to fill their enclosures with different animals. However, there are some difficult decisions to be made. On their turn, a player can either draw a tile from the bag and place it on one of the delivery lorries (which have space for 3 tiles each) or they can take a lorry and keep all the tiles on it. The tiles are either an animal, a coin or a concession stand (i.e. popcorn).